Gazpacho is probably the most refreshing soup ever invented and I wanted to give it a project smoke twist, so I placed those ingredients in a glass bowl, and then I used a handheld smoking device to fill that bowl with wood smoke. The vegetables take on the smoke flavor, but they retain their rawness. They're every bit as cold and refreshing as a traditional Spanish gazpacho. Great gazpacho starts with great tomatoes, preferably vine ripened or picked from your garden or local farm stand. You'll also need diced cucumber, diced sweet onion, garlic, yellow bell peppers, and red bell peppers. Then, tightly cover the baking dish with a sheet of plastic wrap. Make sure the plastic wrap is tightly sealed, but leave one corner open. To smoke the gazpacho, I'm using a PolyScience smoking gun. This handheld smoker is enormously popular with chefs and bartenders, and it's a great device to have at home. Load the burn chamber with your favorite hardwood saw dust. I'm using hickory saw dust. Now, switch the smoking device on and light the saw dust, and you see the smoke comes out. 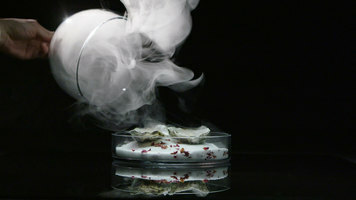 Simply insert the smoking tube into the dish with the vegetables, and tightly form a seal with the plastic wrap, and fill the baking dish with smoke. Let the vegetables absorb the smoke for four to five minutes, then you can uncover. Wow, that is a really nice hickory smoke aroma. Another advantage to a handheld smoking device is that it smokes the vegetables without cooking them. Now, transfer the smoked vegetables to a food processor. Then, close the processor and puree the vegetables. Next, add salt, freshly-ground black pepper, wine vinegar, a little water, and extra virgin olive oil. We'll just take a taste. That is great. Remove the blade, and I like to serve gazpacho in a chilled bowl. Finally, sprinkle the gazpacho with fresh chopped herbs or scallions. Let's see how we did. It's so refreshing and yet there's something different about it. One of the things I love about smoke is its ability to take foods you've eaten your whole life and give them an entirely new perspective. Put a twist on your traditional gazpacho dish with these simple steps! By using the Breville smoking gun, you can add a touch of smoky flavor and aroma to entice your guests. The Smoking Gun Pro from Breville PolyScience has been redesigned for better durability and ease in your commercial kitchen. It makes smoking foods or drinks quick and easy so you can get that wonderful smoky flavor without any of the hassle! 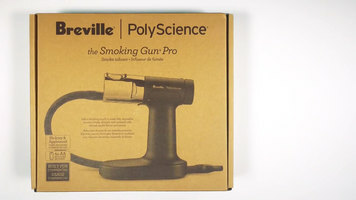 Unbox and easily assemble the Breville PolyScience smoking gun with the help of this video! 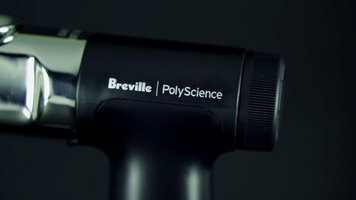 Watch this videos to learn about the features of the Breville Polyscience smoking gun!